Sunshine Reeves Stamped Sterling Bracelet size 8 1/4"
Sunshine is the younger brother of renowned silversmiths Gary Reeves and David Reeves (now deceased). David was instrumental in teaching the craft to both Gary and Sunshine, as well as their half-brothers Darrel and Andy Cadman. Sunshine's work, like that of his brother Gary, is present in the collections of the Heard Museum in Phoenix and he has won numerous awards for his work. This is the sort of signature work for which Sunshine is best known; deep stampwork of intricate pattern which is flawlessly executed (oftentimes consisting of combined geometric motifs commonly employed in Navajo rug weaving). In an attempt to fill out our range of sizes and widths in this style bracelet, we have periodically given Sunshine orders for twenty and thirty of these bracelets at a time in various sizes and widths. We specified the size, width and that they be made with heavy-weight 12 gauge Sterling. We left the artistry to Sunshine. 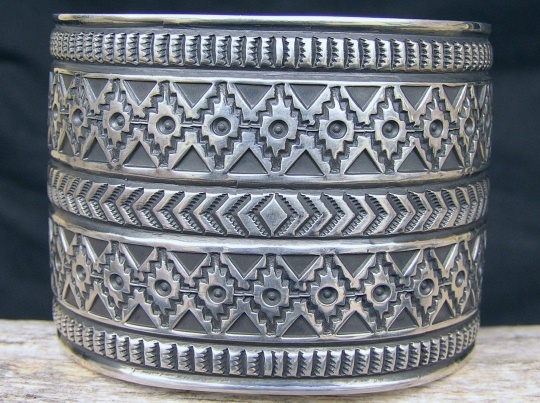 He is one of the best living Navajo stampwork artists, so we knew he'd return some real beauties. Though these are made with sturdy, 12-gauge Sterling, they are adjustable. If you get the right size, you'll never want to take it off. And a piece like this goes with any piece set with turquoise, spiny oyster, coral--any color! The following paragraph deals with size, sizing and adjustability. Note on sizing: This bracelet measures 6 3/4" terminal to terminal. We had Sunshine shape this with a 1 1/2" gap. As your wrist moves in the direction of the elbow, it thickens, becomes more muscular; you'll need a little extra gap on this. Yet this could still be sized down by 1/8" or sized up 1/8". But count on needing 1/8" to 1/4" larger size in this width bracelet than you would need in one which is 1" wide (and a little of that increased size will probably be a touch larger gap). Hallmarked "SUNSHINE REEVES" and stamped "Sterling" inside. Uniform width of cuff: 2 3/16"
Terminal to terminal: 6 3/4" Gap: 1 1/2"
Total inside circumference (including gap): 8 1/4"